Are you a Tampa patient who is considering eyelid surgery? Blepharoplasty, or an eyelid lift can work wonders on your appearance. The eyes are one of the most expressive parts of the face, and communicate your mood and temperament to others without you even realizing it. As we age, the eyelids can droop or sag, making you look older, or less rested than before. Eyelid surgery can address this, making you look happier and more refreshed. The eyes, eyelids, and the periocular region in general are the first areas of the face to show signs of aging. It is no surprise then that eyelid lift surgery is one of the most popular cosmetic surgeries performed in the United States. The demographic of patients seeking eyelid lift surgery has changed as well; many more male patients are seeking eyelid lift and upper facial rejuvenation, with patients, male and female, seeking treatment at a younger and younger age. Interviewer: When someone comes to you for eyelid surgery, what are the common complaints? Dr. Traci Temmen: The complaints that people have when interested in an eyelid lift, or blepharoplasty, are fairly universal. For women, the complaints are “I look tired,” “I look angry,” and “I can’t put my eye makeup on.” For men, the complaints are similar, with sagging eyelid skin, bags under the eyes, and decreased peripheral vision. Interviewer: So who’s a good candidate for this type of surgery? Dr. Traci Temmen: Many people are a good candidate for this blepharoplasty or eyelid lift. Like all of our surgeries, we want healthy patients with no major medical problems such as heart disease, lung disease, or clotting disorders. Chronic medical conditions, like high blood pressure, must be under control. The best candidates are patients that have excess upper eyelid skin, crepey skin or crow’s feet of the lateral eyes, or under eye bags. Interviewer: Does insurance cover this type of procedure? Dr. Traci Temmen: Occasionally insurance will cover an upper eyelid lift, or blepharoplasty, but insurance won’t cover a lower eyelid lift. To get an eyelid lift covered by insurance, you would have to prove that the degree of eyelid sagging, or upper eyelid ptosis, is interfering with the activities of daily living, like driving. You would have to see an ophthalmologist to get visual fields taken. However, this is getting tougher and tougher to get approved through insurance. Very rarely insurance will cover a brow lift procedure, but again, insurance will not cover a lower eyelid lift, which is strictly cosmetic. Interviewer: What are the risks involved? Dr. Traci Temmen: Like any surgery, there is always a risk of bleeding or infection. But particularly with blepharoplasty surgery, the major risk is bleeding. That’s why we will only do an eyelid lift on patients that have medical issues, like high blood pressure, under good control. Patients must also be off any blood thinning medications and be generally healthy. Another side effect of the surgery can be removing too little skin or too much skin during the eyelid lift. Obviously, I would always err on the side of removing too little skin, so occasionally patients will require a touch-up for a little bit more skin removal. Interviewer: How long does it take to recover? Dr. Traci Temmen: The recovery from a blepharoplasty, or eyelid lift, is not that difficult physically because the pain is rather limited and the surgical intervention is small. However, a lot of patients will have bruising and swelling for a fairly long amount of time, maybe even a couple weeks. We say that our patients will be “public ready” in two to three weeks. Interviewer: What about the wrinkles around your eye…does this surgery get rid of those? Dr. Traci Temmen: Yes, it can. It can help with the wrinkles. The smile lines around the eyes, or the crow’s feet, that angle upward towards the eyebrow can be improved with an upper eyelid lift. The smile lines, or crow’s feet, around the lower eye are more difficult to treat with just an upper eyelid blepharoplasty and are better treated with a lower eyelid lift, resurfacing procedures, or Botox and fillers. Interviewer: Would I be asleep during the procedure? Dr. Traci Temmen: If we strictly do a blepharoplasty, a skin-only eyelid lift can be performed under local anesthesia. This means a small shot is given to numb the area and the surgery takes about an hour and the patient goes home the same day. This is very simple. However, a lot of times, our patients have other procedures performed in addition to an eyelid lift, including a brow lift, facelift, or neck lift. These patients may require general anesthesia. Interviewer: What about stitches and scarring? Dr. Traci Temmen: Most of the stitches placed during a blepharoplasty are under the skin and dissolving, so the patient will never see them or feel them. For an upper eyelid lift, I usually do use a suture that has to be removed after about a week. 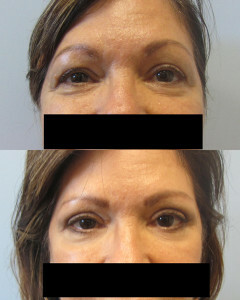 For a lower eyelid lift, all the sutures I use are dissolving and don’t have to removed. Because the skin of the eyelids is very thin, the scar burden is very low, and it’s very rare to have a visible scar a year after surgery. The scar for both the upper eyelid and lower eyelid lift are placed in the eyelid crease and are virtually imperceptible once fully healed. Dr. Traci M. Temmen specializes in eyelid lift, brow lift, Botox, fillers, and fat injections to the periocular region at her Tampa plastic surgery office. Her delicate touch and minimally invasive techniques ensures that each patient achieves a superior, natural result with a fast recovery and minimal down time. An eyelid lift, or blepharoplasty, is a surgical procedure that corrects excess, sagging upper lid skin and fat as well as excess, crepey paper-like, lower lid skin and lower lid bags. The removal of this excess skin leaves the patient looking happier and more rested. Many people, as a result of either aging or genetics, have heavy, sagging upper eyelid skin and bulging fat. This change in the upper eyelid can give the appearance of premature aging, and when severe, the upper eyelid can even obstruct vision. During an upper eyelid lift, a small incision is made in the upper eyelid crease and a small ellipse of skin is excised. Through this same incision, small amounts of fat in the inner corner of the eye can be removed, providing for a smooth, sharp upper eyelid crease. For those with small amounts of eyebrow descent, a mini-brow lift, or brow-pexy can also be performed through the eyelid lift incision. This combination of skin excision, fat removal, and brow lifting results in the appearance of a larger eye with a more youthful and refreshed appearance. The scar for both an upper and lower eyelid lift or blepharoplasty surgery is virtually invisible after a few months. The scar for an upper eyelid lift is placed in the natural upper eyelid crease while the scar for a lower eyelid lift is placed right under the lower eyelid lashes. Both scars generally heal very well and become difficult to detect, even by patients and their plastic surgeon a few short months later. During consultation for an eyelid lift surgery, Dr. Temmen describes the procedure in detail and gives a precise description of the expected scar quality and location. The recovery following eyelid lift or blepharoplasty surgery is generally uneventful. Patients are given oral pain medications and may be given antibiotic and anti-nausea medications as well. Most patients experience a few days of bruising and swelling the decreases rapidly over a period of days to weeks. Those undergoing an eyelid lift surgery are generally able to drive and return to work within a few days to a week, and any residual bruising can be covered with makeup. Dr. Traci Temmen and her staff at the Plastic Surgery Center of Tampa take great pride in educating and preparing each patient for eyelid lift and blepharoplasty surgery. Dr. Temmen sees all her patients within a day or two of the procedure in order to reassure and closely monitor the recovery process. After deciding on the specific eyelid surgery procedure and plastic surgeon, most patients are naturally interested in the price of eyelid lid and blepharoplasty surgery. The price of eyelid surgery varies greatly depending on the region of the country, type of anesthesia, complexity of the operation, and number of procedures performed. In the Tampa Bay region of Florida, a simple upper eyelid lift or blepharoplasty procedure performed under local anesthesia may cost as little as $3,900. While eyelid lift surgery can be a relatively quick and easy operation, it is best to choose a plastic surgeon that has the required training and experience to provide safe, effective, natural, and long-lasting results. Choose a plastic surgeon certified by the American Board of Plastic Surgery who operates in a facility accredited by the American Association for Accreditation of Ambulatory Surgery Facilities (AAAASF). Dr. Traci Temmen is a female, board-certified plastic surgeon that operates only in AAAASF approved facilities. Fortunately, the most common complications following an eyelid lift surgery are easily managed in the office and self-limiting. The most common side effect of blepharoplasty surgery is bruising and swelling that can last for weeks; because the eyelid skin and tissues are very delicate, it may actually take several weeks for all swelling to fully resolve. Bruising and swelling can be managed with elevating the head while sleeping and relaxing, ice packs, controlling blood pressure, and avoidance of blood thinning products pre- and postoperatively. Another less common complications of eyelid lift surgery is irritation and swelling of the conjunctival lining of the eye (i.e. chemosis). This can often be reduced with meticulous and delicate surgical technique and symptoms can be lessened with eye drops, lubricants, and protective covering postoperatively. Additional risks of eyelid and blepharoplasty surgery, which are far less common, are postoperative malposition of the lower eyelid, removal of too little or too much skin requiring reoperation, noticeable scarring, bleeding, and infection. Dr. Traci Temmen is a gentle and conscientious plastic surgeon well trained in preventing, diagnosing, and effectively treating the side effects of eyelid lift surgery. Dr. Traci Temmen and her staff are proud to showcase their previous patients’ eyelid lift and blepharoplasty surgery before and after photographs on the website. In addition to those on the website, additional before and after eyelid surgery photographs are available for viewing and discussion during each patient consultation. For more information on Dr. Traci Temmen, eyelid lift, blepharoplasty, facial fat grafting, and brow lift or forehead lift, please contact her practice at (813) 877-2277.